One of the things I love about India is that the stories most sacred to the culture are preserved everywhere. From street shrines to oversized temple statues, references to the ancient Sanskrit epics of the Ramayana and the Mahabharata are ubiquitous. After a while even interlopers like me get good at finding Rama, the Monkey King Hanuman and the Demon Ravana. Those songlines run deep in subcontinental consciousness, but they also remind me that we have songlines of our own even if they are not quite as ancient. One of the stories most Americans know is about the Great Depression and the devastation of the Dust Bowl. Drought and farming practices in the 1930s led to the loss of millions of acres of farmland, forcing hundreds of thousands of “Okies” to become homeless migrants in search of work at a time when jobs were scarce. Woody Guthrie lived through the indignities of that era, writing music that came to stand for the rights of the disenfranchised. 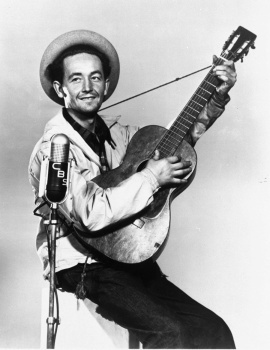 He believed in “singing for the plain folks and getting tough with the rich folks.” Guthrie lived what he wrote, and his music was for those who were living the “left out” life too. Without Guthrie we have no Pete Seeger, no music of protest, no Bob Dylan. He’s our lynchpin. Woody Sez, currently at the American Repertory Theater in Cambridge before heading next to Germany (cool!) 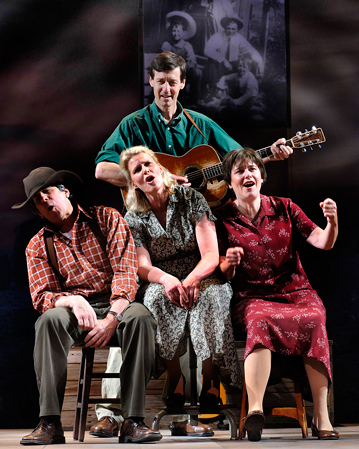 and Chicago, is an unforgettable retelling of that American epic story through the life of Woodrow Wilson Guthrie. A quartet of multi-talented performers—David Lutken, Darcie Deaville, Helen Jean Russell and Andy Teirstein—will grab you from the get go and never let you go. The music is nonstop, and every member of this high energy, well-rehearsed quartet can sing and play muliple instruments. The staging is simple and the set unadorned, just as it should be. And just as Woody would have wanted it. The relevance of this story for today’s times is powerful. To state the obvious—that we live in a culture that rewards greed, selfishness and personal aggrandizement at any cost—often ends up sounding like a broken record that no longer has any bite. But watching this performance put our American songline of injustice and income inequality into a context that is much deeper and more profound than I had expected. I absolutely loved seeing Woody Sez, and I would recommend it to everyone. Was a great high wall there that tried to stop me, A sign was painted said: “Private Property”, But on the back side, it didn’t say nothing. That side was made for you and me. Life has got a habit of not standing hitched. You got to ride it like you find it. You got to change with it. If a day goes by that don’t change some of your old notions for new ones, that is just about like trying to milk a dead cow. I hate a song that makes you think that you are not any good. I hate a song that makes you think that you are just born to lose. Bound to lose. No good to nobody. No good for nothing. Because you are too old or too young or too fat or too slim or too ugly or too this or too that. It’s round the world I’ve traveled; it’s round the world I’ve roamed; but I’ve yet to see an outlaw drive a family from its home. If you play more than two chords, you’re showing off. The idea of self is…an artificial construct…Yet the word is common enough even in everyday usage for a cultural community to agree, to some extent, on a kind of consensus. There is something within every human being that we commonly call a “self.” Loss of that self is generally considered a grievous wound. Its willing surrender, on the other hand, can be considered in religious and philosophical terms, a blessed arrival at another state of being. In some instances the self is conflated with the idea of soul. With that as her starting point, Novak then charters an unexpected journey. An art historian by training, she has paired writers and artists who share particular similarities. The couplings are in some ways surprising: Copley and Edwards, Emerson and Lane, Whitman and Church, Homer and James, Pollock and Olson, among others. But insights emerge from these partnerings that are fresh, provocative, meaningful. This book came into being out of my initial interest in what I have called the “erasure of self” so prized by the early American Puritan culture and in its visual manifestation in some images from the late eighteenth and mid-nineteenth centuries. I then discovered that the ostensible erasure of self was not so much a loss as a transfer, at times a transfer into matter or object, into “things,” and through erasure of the artist’s signature, “stroke,”to an ostensible larger self referred to by Emerson as the Over-Soul. So one subtext here might be the role of “things” as they relate to self in American culture. That’s a compelling theme to me, and one that has a long lineage. Novak rides it out thoughtfully and thoroughly, from Edwards to Emerson, from Dickinson to Olson. A good read for writers, readers and artists. As unpleasant as air travel has become, it still serves up that delicious, “put your headphones on and block out the world” slot of time to just read. This weekend it was spent devouring Sarah Bakewell’s captivating and award winning book, How to Live: A Life of Montaigne in One Question and Twenty Attempts at an Answer. Always on the lookout for innovative ways of sharing, expressing and communicating, I found Bakewell’s format well suited for our current style of information ingesting. Ideas are chunked into chapters that can be read easily from start to finish on a subway ride or in a waiting room. Perfectly sized at blog post plus, each chapter is one of the many answers Montaigne offered to his overarching question: How to live? Reflect on everything; regret nothing. In each chapter we learn a bit more about how Montaigne employed his point of view. While moral dilemmas interested him, Montaigne was less compelled by what people should do. His focus was on what they actually did. His voice is so refreshingly nonmoralistic or instructional; he observes everything—other people, animals and himself—with a spirit of compassion, non-judgment and genuine delight. Montaigne created the idea simply by doing it. Unlike most memoirists of his day, he did not write to record his own great deeds…A member of a generation robbed of the hopeful idealism enjoyed by his father’s contemporaries, he adjust to public miseries by focusing his attention on private life. In some ways Montaigne is a writer for middle age. I remember first reading his Essays when I was in high school. But the wisdom is the kind that rings true later in life, after you’ve explored a thousand ways things DON’T work. His willingness to say “who knows?” to just about everything (and that 100 years later enraged both answer-crazed thinkers like Descartes and Pascal) is a way of living in a world being torn apart by extremism. 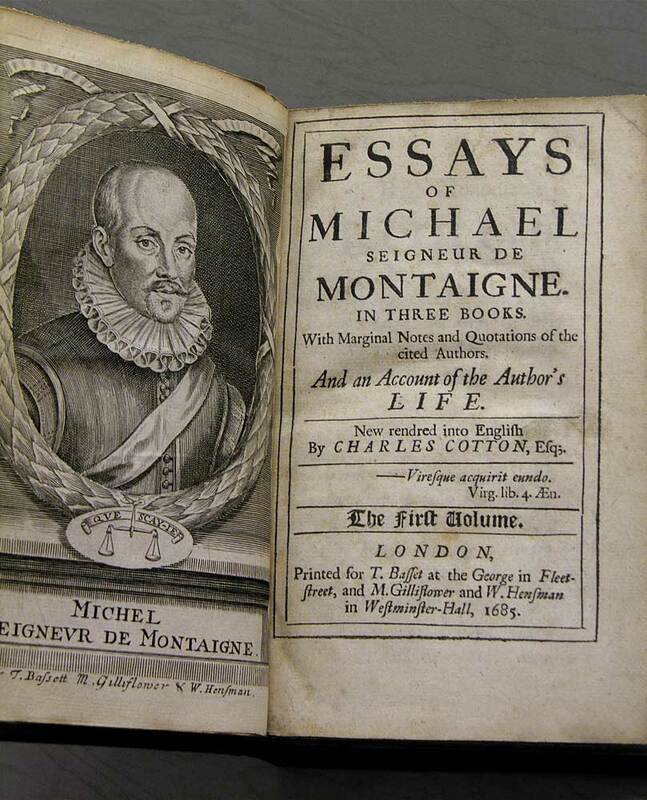 Montaigne…proved himself a literary revolutionary from the start, writing like no one else and letting his pen follow the natural rhythms of conversation instead of formal lines of construction. He omitted connections, skipped steps of reasoning, and left his material lying in solid chunks, coupe or “cut” like freshly chopped steaks. “I do not see the whole of anything,” he wrote. Ah Montaigne, beloved master of the both/and. April 15, 1967 Spring Mobilization to End the War, San Francisco (API). This is a chapter from my account of the story. I can’t sit by and let the 40 year anniversary of Woodstock come and go without taking a moment to reconnect with my own memories of those days. You know, the ones that have been named with an innocuous number, “The 60’s,” as if to sidestep any claim to an ideological legacy. There’s the movie, Taking Woodstock, and the nostalgia it has stirred up. And with the return of Mad Men and its time line that is edging ever closer to the cultural breakdown (or more aptly, breakout?) that will dismantle the world where Don Draper and his minions now live, I am thinking about that time more than I have in a long time. My favorite 60’s retelling in cinematic form is the 6 hour splendor of Best of Youth, directed by Marco Tullio Giordana. An experience unlike any other, this Italian version of those years (and the ones that followed) parallels many aspects of my own youth spent growing up in the San Francisco Bay Area. But there are many nation-specific differences that make this version feel unique and fresh. For an American reader, this difference is striking. The civil rights and black power movements were crucial in shaping the politics of the American ’60s, providing moral energy and lessons in organizing. Diski barely mentions them. The American antiwar movement, fueled by college students at risk of being drafted, understandably had a much smaller counterpart in Britain. You see what she’s after: “freedom,” a crucial term in both eras, changes meaning from “unconstrained exploration of possibility” to “unfettered capitalism.” And it’s certainly true that many of the ’60s young grew up and, for all sorts of reasons, became yuppies. But the governments of Reagan and Thatcher had such deep economic and philosophical roots, and appealed so consciously to people made uncomfortable by the changes of the 1960s, that it seems misleading to read much into the shared vocabulary. The Economist’s More Intelligent Life conducted an online poll asking the question, What was the most important year in human history? The winner as of right now is 1439, the year Gutenberg invented the printing press. Here’s the list as it currently stands. BTW, it isn’t too late to cast your vote, which you can do here. The oil canvas is thought to have been painted in 1610 – six years before the playwright’s death – when he was about 46 years old. It remained in the same family for centuries and was inherited by art restorer Alec Cobbe. In 2006, he visited the National Portrait Gallery and saw a painting of Shakespeare that hangs in the Folger Shakespeare Library, Washington. It had been accepted as a life portrait of Shakespeare, but was discredited 70 years ago. 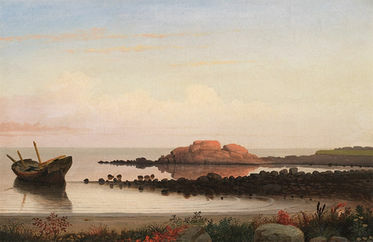 Mr Cobbe saw the painting and realised the similarities with the painting he had inherited. Believing his painting to be the original, he contacted Professor Stanley Wells, chairman of The Shakespeare Birthplace Trust, who was initially sceptical. Investigations were carried out by Professor Rupert Featherstone, director of the Hamilton Kerr Institute at Cambridge University which focuses on conservation of easel paintings, Hamburg University where they dated the oak panelling of the painting and Tager Stonor Richardson, which carried out infrared imaging. Mark Broch, curator of the Cobbe Collection also carried out painstaking research. 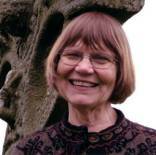 Prof Wells said: “My first impression was scepticism – I am a scholar. But my excitement has grown with the amount of evidence about the painting. Thirty years ago today more than 900 people died Jonestown, a settlement in the jungle of Guyana. Often called a “massacre,” the victims in Jonestown participated in their communal demise willingly. They had practiced dry runs of this mass suicide several times before they did it for real on November 18, 1978. The Jonestown community consisted primarily of people from the San Francisco Bay Area. Originally called the People’s Temple, the church was founded by James Warren Jones, a man who had no official theological training. He based his ministry on a blend of religion, socialist philosophy and bucket loads of fear, isolation and blind obedience. Jones was a powerful presence, and his flock grew rapidly in the early 1970s. When mounting negative press and a pending IRS investigation threatened his unquestioned hegemony, he decided to move his congregation far from American jurisdiction. He bought a tract of land in Guyana and then in 1977, the community began a mass relocation to South America to live on an agricultural collective and practice their communal principles. Responding to the concerns from many of his constituents about what was going on in Jonestown, California Congressman Leo Ryan flew down to the Guyana settlement in November 1978. After one of Jones’ followers tried to kill him his first day in Jonestown, Ryan decided to return to the U.S. immediately, bringing some Jonestown residents who wanted to leave with him. As the group boarded their plane, guards sent by Jones opened fire on them, killing Ryan and four others. When Jones learned that some members of Ryan’s party had escaped alive, he told his followers that Ryan’s murder would make it impossible for their commune to continue functioning. Rather than return to the United States, they could preserve their church by making the ultimate sacrifice and offer up their own lives. Jones’s 912 followers were given a deadly concoction of Kool-aid mixed with cyanide, sedatives, and tranquilizers. Jones apparently shot himself in the head. Georgia Mae Catney moved to California from Arkansas when she was a young woman and found work as a domestic. She came into my family’s life when I was a small child, and she quickly became a steady and loved member of our extended family. Georgia Mae was a Clydesdale. She was very strong physically and a tireless worker. My mother, also raised on a farm in rural America, shared her “work, don’t whine” approach to life. The two of them were a formidable team, working side by side to whip our house and the 7 resident children into shape every week. We learned early on that crossing Georgia Mae wasn’t a good idea. Her mother used to punish her by making her kneel on beans, and she could do much worse by you without a second thought. We got that, and all of us had a quiet respect for her tough, take no prisoners approach to childrearing. Her good for nothing husband (by her reports) had left her some time before, so as a woman on her own she was frugal and cautious about money. And even though she could neither read nor write, she quoted the Bible constantly. Raised in a strict southern Christian tradition, she loved to talk about Jesus. When I was still a teenager, she took me with her to her local church. The crowded meeting hall was full of singing, swaying, exhuberant devotion, a far cry from the understated Christian tradition of my family. She joined the others in singing out her deep love of Jesus, thanking him for saving her. I moved to New York City in the early 70s so I only saw Georgia Mae occasionally during my visits home. Sometime after I left California, my mother mentioned that Georgia Mae had joined a new church and was very excited about the minister. 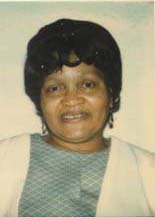 My mother also noticed that all the checks she wrote to Georgia Mae were now being endorsed directly to the People’s Temple, something that she found peculiar but did not raise as a question with Georgia Mae. In August of 1977 with no prior warning, Georgia Mae announced to my mother that she was leaving California for good. Surprised and saddened by this news, my mother couldn’t get much information out of her about why she was moving away or where she was going. Georgia Mae’s only response was that her minister had told her that because she was black, it was not safe for her to stay in America. He was creating a place where she and her friends would be safe from harm. When her name showed up on the list of Jonestown dead, everyone in my family was deeply grieved. As hard an outside shell as she appeared to have, there was a purity and innocence in her that made her terribly vulnerable. Her sad end still haunts me. On this, the 30th anniversary of that horrific day, I stop to take a moment to remember and honor her life. As a follow up to my posting on March 9th regarding this last outbreak of false memoirizing, here are a few more bubbles under that tablecloth that can move around but never disappear. Jill Lepore, a prof at Harvard, has written yet another of her fascinating articles for the New Yorker magazine. She’s so damn smart, I am always excited when I find her name listed on the weekly Table of Contents. Historians and novelists are kin, in other words, but they’re more like brothers who throw food at each other than like sisters who borrow each other’s clothes. The literary genre that became known as “the novel” was born in the eighteenth century. History, the empirical sort based on archival research and practiced in universities, anyway, was born at much the same time. Its novelty is not as often remembered, though, not least because it wasn’t called “novel.” In a way, history is the anti-novel, the novel’s twin, though which is Cain and which is Abel depends on your point of view. This topic is even more interesting than I had imagined. What is it that Tom Stoppard does that moves me so deeply? Rock ‘n’ Roll was as intoxicating an experience as Coast of Utopia had been the year before. In many ways it is a continuation of many of the same themes, just brought forward 100 years and closer to home. (The play takes place in England and what was once Czechoslovakia, the bloodlines of Stoppard’s own identity.) We are still struggling with how history unfolds, how any one person can stand up, with honor, to the inexorable thrust of politics, of grand scale human folly, of historical precedence replaying itself over and over again, of disastrous conceits and misfired intentions. In both Rock ‘n’ Roll and Coast of Utopia, Stoppard arcs his narrative out over many years and several generations. His voice does not speak to the concerns of his particular cohort group. Rather he traces the fractal pattern of how ideas grow, from what is frequently an inauspicious and unintended germination to historic unfoldings that explode with little regard for extenuating circumstances like truthfulness, appropriateness, or the achievement of any modicum of long term human benefit. The threads and leitmotifs in these plays are complex, provocative and interconnected, yet they are not delivered with anything approaching resolution. Stoppard poses profound questions about human existence that do not have answers. Intimations and flashes of possible resolutions come and go, but those moments are fleeting, a glinting parsec vision of what might have been. “Rock ‘n’ Roll” is a subtle, complex play about ways to resist ‘systems’ and preserve what is human. At its core is a succession of arguments between two Czech friends, Jan (who holds some of Kundera’s attitudes) and Ferda (who more clearly represents Havel, and borrows lines from some of Havel’s famous utterances). Jan, forced to work as a kitchen porter, at first despises Ferda’s petitions against arrests and censorship as the self-indulgence of an intellectual clique. A devout rock enthusiast, he sees the persecuted rock band the Plastic People of the Universe (who actually existed) as the essence of freedom because they simply don’t care about anything but the music. They baffle the thought police because ‘they’re not heretics. They’re pagans’. Ferda at first dismisses the Plastic People as long-haired escapists who have nothing to do with the real struggle. But later, when they are arrested and imprisoned after an absurd trial, he comes to understand that the heretics and the pagans are inseparable allies. Leaving the band’s real-life trial, Havel famously said that ‘from now on, being careful seems so petty’. Soon afterwards a few hundred brave men and women signed ‘Charter 77’, the declaration of rights and liberties which earned them prison sentences and suffocating surveillance but which was read around the world. There is dissent which wants to substitute one system for another. And there is dissent which simply says: Get off our back, scrap all the guidelines and controls, and humanity will reassert itself. Ever since it was first published in 1998, Uncontrollable Beauty: Toward a New Aesthetics, edited by Bill Beckley with David Shapiro has been my primary text. This collection of essays brings together the thinking of artists and critics on the greatly misunderstood (and much maligned) topic of beauty. Uncontrollable Beauty embodies many of the reasons why I began blogging in the first place. It speaks to what was not being paid attention to, written about, dialogued, analyzed or acknowledged in the contemporary world of art. Agnes Martin: When I think of Art, I think of Beauty, Beauty is the mystery of Life. It is not in the eye, it is in the mind. In our minds there is awareness of perfection. Peter Schjeldahl: ‘Beauty is Truth. Truth Beauty?’ That’s easy. Truth is a dead stop in thought before a proposition that seems to obviate further questioning, and the satisfaction it brings is beautiful. Jeremy Gilbert-Rolfe: In the art world, the idea of the beautiful is always threatening to make an appearance or comeback but it tends always to be deferred. Santayana: To feel beauty is a better thing than to understand how we come to feel it. Louise Bourgeois: Beauty? It seems to me that beauty is an example of what the philosophers call reification, to regard an abstraction as a thing. Beauty is a series of experiences. It is not a noun. People have experiences. If they feel an intense aesthetic pleasure, they take that experience and project it into the object. They experience the idea of beauty, but beauty in and of itself does not exist. Experiences are sorts of pleasure, that invoke verbs. In fact, beauty is only a mystified expression of our own emotion. So I was particularly delighted to add a new volume to my favored bed stand stack–another articulate defense of art that is not just cerebral, conceptual, emotionally detached and non-retinal. Ellen Dissanayake, author of Homo Aestheticus: Where Art Comes from and Why (which was first published in 1992!) approaches philosophical aesthetics from an unexpected point of view. She does not approach art as a scholar of visual language but as an ethologist and anthropologist. Her claim is that art is as intrinsic to human life as other observable behaviors like the proclivity to ritual, play, seeking sustenance. This tendency in us to “make special” is biological and as Dissanayake has termed it, “species-centric.” She spends several chapters of her book examining the anthropological parallels of art in other cultures, but it is her extraordinary skill at seeing through the vacuity of postmodernism in the visual arts that makes this book a terrific and reinforcing read for anyone interested in these issues. While artists and art teachers might especially welcome a biological justification for the intrinsic importance of their vocation, everyone, particularly those who feel a loss or absence of beauty, form, meaning, value, and quality in modern life, should find this biological argument interesting and relevant. Ironically, today, words such as beauty and quality may be almost embarrassing to employ. They can sound empty or false, from their overuse in self-help and feel-good manuals, or tainted by association with now-repudiated aristocratic and elitist systems in which ordinary people were considered “common” for not having the opportunity to cultivate appreciation of these features. But the fact remains that even when we are told that “beauty” and “meaning” are socially constructed and relative terms insofar as they have been used by elites to exclude or belittle others, most of us still yearn for them. What the species-centered view contributes to our understanding of the matter is that knowledge that humans were evolved to require these things. Simply eliminating them creates a serious psychological deprivation. The fact that they are construed as relative does not make them unimportant or easily surrendered. Social systems that disdain or discount beauty, form, mystery, meaning, value and quality—whether in art or in life–are depriving their members of human requirements as fundamental as those for food, warmth, and shelter.